Jay Corley founded Monticello Vineyards out of inspiration from Thomas Jefferson's love for wine and Virginia roots. Inspired by Thomas Jefferson who once said, "Good wine is a necessity of life for me," Jay Corley founded Monticello Vineyards. Because he shares Mr. Jefferson's love for wine and viticulture as well as his ancestral roots in Virginia, Jay named Monticello Vineyards in honor of the great American President. In 1969 Jay set out to find the right soils on which to build his dream. He found them in the Napa Valley. Initially, Jay grew grapes as a professional farmer, selling grapes to wineries during the 1970s. In 1980, Monticello celebrated their first crush with Chardonnay and Cabernet Sauvignon. Today Monticello Vineyards produces about 15,000 cases a year, focusing on six varietals: Chardonnay, Cabernet Sauvignon, Cabernet Franc, Merlot, Pinot Noir, and Syrah. These grapes come from five different vineyards that encompass 112 acres. At Monticello, a hands-on, family-oriented approach guides every level of the process. Jay's three sons, Kevin, Chris, and Stephen are not only co-owners of the winery but also the winegrower, winemaker, and sales/marketing director respectively. This aptly reflects their philosophy 'sunshine to wine'. As Stephen explains, "It helps that we're small enough and passionate enough to walk every vine row, taste every wine, and talk to most every customer." They may be small, but Monticello has proved to be a force in the wine industry. Bearing three designations: Monticello Vineyards; Corley Propriety Red Wine; and Corley Reserve, their wines have received countless accolades and 90+ point ratings from publications like Wine Spectator, Wine Enthusiast, and Wine & Spirits magazines. 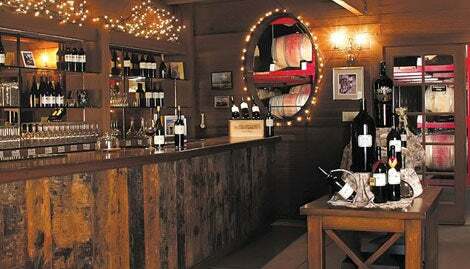 Guests are invited to taste these outstanding wines at the cozy tasting room at Monticello Vineyards. However, the most noteworthy edifice on the property might be the one designated for private tastings and dinners. It is a downsized replica of Thomas Jefferson's elaborate plantation home, Monticello, after which the Corley family winery was named. Located north of Napa Town limits on Hwy 29. Turn right on Oak Knoll Ave., turn right again on Big Ranch Rd. The winery is on the left.